From the articles on elementary physiology which * have already appeared in this series it can be seen that the human body consists of various organs engaged in some particular work. The stive system, which we have studied, contains all the organs for the conversion of food into nourishment for the body. The heart is the organ for the propulsion of blood through the body, and the lungs have to do with the oxygenation of blood. It is with the construction and working of the nervous system that this article will deal. Medical the organs of the body to ensure that they do their special work. This is supplied in the form of the delicate apparatus called the Nervous System, which regulates every organ, every muscle, every part of the body. Because we are supplied with a nervous system we are sensitive, active, reasoning beings. Because our brain is a highly developed organ, we possess, or ought to possess, reason, intelligence, reverence, and understanding. For the sake of description we shall divide the nervous system into four parts: (1)The brain, (2) the spinal cord, (3) the nerves, (4) the sympathetic system; and we shall consider them in turn. The brain is a complicated mass of nervous matter, contained in the skull, which is a bony box less than a quarter of an inch thick. The brain is made up of nerve-cells and nerve-fibres. These nerve-cells are microscopic in size, very complex in structure, and lie over the surface of the brain, forming what is called the grey matter. In this grey matter, which is the most wonderful substance in the whole of creation, all ideas are formed, "will" is originated, and sensations are perceived. It is the organ of consciousness - in a word, the mind. It is by reason of our minds that we are thinking beings, that we are able, however imperfectly as yet, to get into conscious relationship with the visible universe. Nerve-fibres of the brain pass from the nerve-cells downwards to the spinal cord, and are in connection with all parts of the body by means of the nerves, which pass out from the spinal cord. The brain weighs about three pounds. A woman's brain weighs a few ounces less than a man's. This fact was formerly regarded as a positive proof that woman was intellectually inferior to man. Greater knowledge, however, has demonstrated that quality of brain, not quantity, is all-important. If the skull could be opened, the living brain would be found to be enclosed in three protective membranes, between which lies a quantity of fluid. This furnishes a sort of water-bed to protect the soft semi-solid organ. The surface of the brain is raised into a series of folds called "convolutions." These convolutions increase the surface area of the brain, and the different convolutions have their different functions. For example, if one could stimulate a convolution lying about the middle of the right side of the skull we should cause the leg or arm on the opposite side of the body to move, because the muscles are controlled by that particular area of the brain. The brain consists of two halves, or hemispheres, which are separated from one another by a deep cleft. The right side of the brain controls the left side of the body, and vice versa, and the two sides of the brain communicate and act with each other. It is impossible in this space to give any idea of the wonderful functions of the different areas of the brain, but it may be said speaking broadly, that the front part of the brain behind the brow has to do with the intellectual functions. The middle area of the brain rules and regulates locomotion, or movement. The posterior area lying at the back of the head has to do with sensation. From the lower part of the brain a tail-like projection tapers downwards measuring about eighteen inches in length. This is the spinal cord which lies inside the bony spinal column just as the brain lies inside the skull. The spinal cord is about the thickness of the little finger above, and becomes smaller as it passes down the spinal canal. By means of the spinal cord the brain can communicate with the nerves going to the rest of the body. These nerves pass off in pairs from the spinal cord, and make their exit from the spinal column, or vertebral column, through little openings down each side. There are thirty-one pairs of spinal nerves and twelve pairs of brain nerves, or cranial nerves, which come off the brain itself. The cranial nerves supply the face and head. The first pair, for example, are called the optic nerves, and they pass to the back of the eyes and carry messages from the eye-structures to the brain, which thus perceive light and various objects. The second pair of cranial nerves have to do with the sense of smell, and therefore pass to the nose. Another pair are called the auditory nerves, or nerves of hearing. The rest of the cranial nerves are distributed to the face, head, and neck. One pair of cranial nerves called the "facial nerves" supply the mucles of expression. If one facial nerve is cut off from its communication with the brain, as happens in certain cases of paralysis, for example, we have one side of the face a blank, because the muscles supplied by the facial nerve are no longer controlled by the brain. 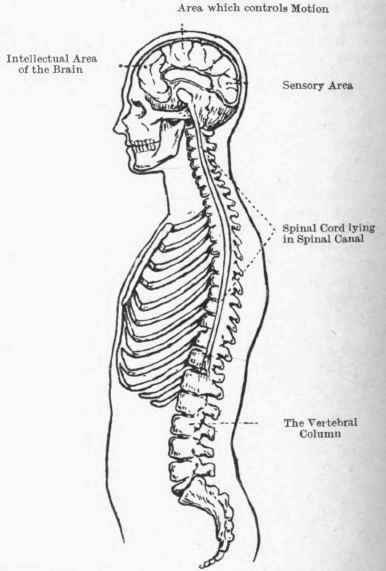 Diagram of brain and spinal cord. The convolutions of the brain are shown, and the tail-like spinal cord lying in the spinal canal. In appearance the nerves are white cords consisting of nerve-fibres, and vary a great deal in size. The smallest is only just visible to the naked eye, whilst the sciatic nerve in the thigh is nearly as large as the little finger. The function of these nerves is extremely interesting. In the first place they convey sensation to the brain. Medical nerve of the finger, up the arm to the spinal cord, and thence to the brain-cells. These brain-cells send the message to another part of the brain which controls motion, and the cells in this area of the brain send a message down the spinal cord to the nerves supplying the muscles of the arm and finger. These would contract and the finger would be drawn away. This action appears to be instantaneous because nerve impulses pass so rapidly to and from the brain, but it really takes a certain fraction of a moment. Now, supposing for any reason the nerve of the arm and finger was paralysed or cut in two. The brain could not receive a message from the finger, nor could it send a message to the muscles of the finger. No pain or sensation of heat would be felt, and the finger would be burnt. Thus it will be seen that the nerves of the body are a vast telegraphic system carrying messages, or sensations of pain, cold, and heat, to the brain. Every nerve contains what are called sensory fibres, which carry sensation to the brain, and motor fibres, which carry messages from the brain to the muscles. In paralysis there is a break somewhere between the nerves and the brain. A paralysed arm or leg has no power of movement because the brain cannot send its message to the nerves of the muscles of the part. In the same way the paralysed limb can feel neither heat, cold, nor pain. These ganglia are, as it wen, minute brains, and they send out branches which form networks of nerves round the organs. The function of this system is to regulate the action of the organs of the body associated with nutrition In invertebrate animals, such as the jellyfish, the worm, etc., the nervous system has only this form, but the higher animals, or vertebrates (fish, reptiles, amphibians, birds, and mamma have a brain, a spinal cord, and nerves in addition. 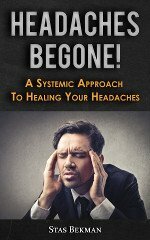 Because we possess a sympathetic system in addition to our higher nervous system our various organs work imperceptibly, without will or consciousness, and we are not conscious in health that our stomachs are working, that our hearts are beating, or that our lungs are expanding and contracting. This adds very much to our comfort and convenience. The sympathetic nervous system is, in a sense, independent of the higher nervous system, but it is really influenced by the brain. Because of this influence, when our organs are out of order. we are made aware of the fact, because we feel pain or discomfort. The thoughtful person will have gathered from this article one fact which bears intensely upon the philosophy of life. It is that pain is a good thing. Pain is Nature's warning. It is protective. . If we could not feel pain we should have no knowledge that our hands were burnt, that we were in danger of losing our noses from frost-bite, or that our digestive system was being overtaxed in some way. Mental pain, or unhappiness, can be regarded from the same point of view, but this is a subject which is outside the scope of an article which deals only with simple physiology. The next article in this series will deal with the Skin and its Function, the Muscles, and Fat.